Share the Love in BW2 with Valentines 2019! Tags: event, bw2, valentines, 2018, update. Nate needs to prove he's likable, and eventually he'll have to pick a date. Afterwards, help the one he doesn't pick get over her grief with some Ice Cream daily quests until it's time to help Nate’s rejected girl through the 5 stages of grief. All five quests will unlock right after each other and then she will have a new daily quest for you. Jim and Sasha's relationship quests are around. If you haven't married them yet, you'll see either their Dating or Proposal quest line. If they are married, you get to help the pair pack for their honeymoon, or celebrate their anniversary. You can also learn how to play guitar to serenade your loved one! And who is that mysterious note from this year? Nate needs to prove he's a likeable guy. How will this endeavor end? If you can complete the event, you'll earn this awesome 100% reward carousel creature! Starting next Friday, the 3 new Valentine's themed pets for this year will be available to purchase over the weekend! Can they woo your heart? There are a total of FIFTEEN possible achievements to earn in the Valentine’s Day 2019 event. Setup Wizard - You helped the party organizers with all their tasks. Guitar Training - Follow through with Virtuoso Guitarist Jimmie's lessons. A Secret Admirer - Find a note from a true secret admirer. We also have 6 achievements from previous years which may be earnable by spending Bush Bucks if you missed getting them the first time around. Hearts Hearts Hearts! - You bought all the Valentines things from 2016! Passionate Purchases - You bought all the Valentines things from 2017! *The Valentine’s mini-golf piece is not included in the Winsome Wardrobe achievement. This event runs until Friday February 22nd @ Noon PST (8pm GMT). BW2 Gets Romantic with Valentines 2018! Nate wants a Teddy Bear. Will things go well? 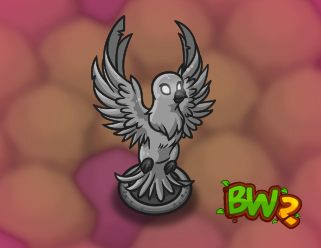 If you can complete the event, you'll earn this awesome 100% reward statue! There are a total of FIFTEEN possible achievements to earn in the Valentine’s Day 2018 event. We also have 5 achievements from previous years which may be earnable by spending Bush Bucks if you missed getting them the first time around. *The Valentine’s mini-golf piece is not included in the Romantic Acquisitions achievement. This event runs until Friday February 23rd @ Noon PST (8pm GMT). Tags: event, bw2, valentines, updates. Jim and Sasha's relationship quests are around. If you haven't married them yet, you'll see either their Dating or Proposal quest line. If they are married, you get to help the pair pack for their honeymoon. Learn how to play guitar to serenade your loved one! Also, who is that mysterious note from? There are a total of FOURTEEN possible achievements to earn in the Valentine’s Day 2017 event. We also have 4 achievements from previous years which may be earnable by spending Bush Bucks if you missed getting them the first time around. *The Valentine’s mini-golf piece is not included in the Passionate Purchases achievement. This event runs until Friday February 24th 2017 @ Noon PST (8pm GMT).